In college I had a few goals, one of my top five goals was to perfect my cold peanut noodle recipe. I think that's a totally normal + reasonable goal for college. But yes, I was going to graduate with a degree in media studies + a killer peanut noodle recipe that would send people to their knees. Unfortunately I made many, many horrible peanut butter noodles. There was the time I boiled rice noodles for as long as you would spaghetti. I don't know much about rice noodles, but that's definitely not what you are meant to do to those delicate guys. There was also the time I didn't have regular peanut butter, so I thought that using the white chocolate peanut butter I had gotten as a freebie would make sense. I wouldn't recommend it. So long story short, I graduated without figuring out a killer peanut noodle recipe. They handed me my diploma, but something didn't feel right. So I spent some time rethinking this + a recipe came via a family friend in my inbox. The recipe looked good, but called for a bit more sugar and too little texture for my taste, so I gave an adaptation a go. Here's the result! 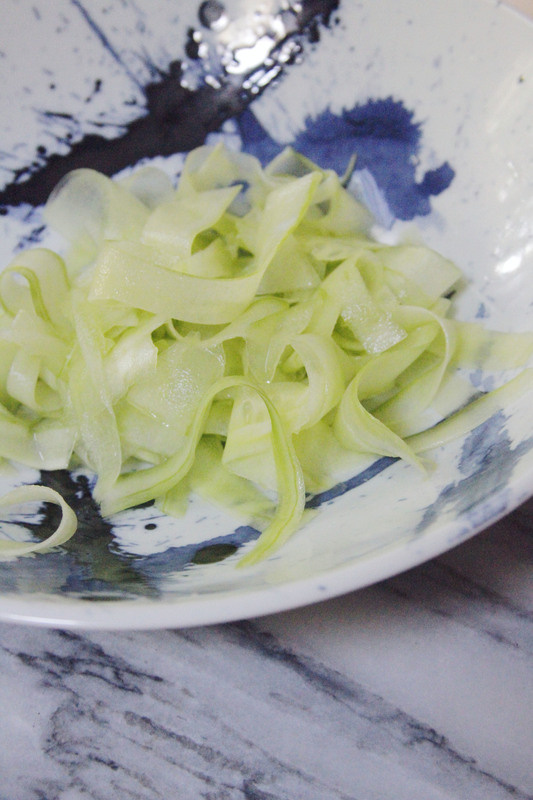 You can do these noodles straight up with the sauce, but I think what makes it perfect is the crunch from salty peanuts, bite from tons of fresh mint + coolness from shaved cucumber. Prepare the spaghetti according to the directions on the box, but make sure to salt the water! Meanwhile whisk up the peanut sauce. Combine peanut butter, olive oil, soy sauce, sugar, rice wine vinegar + sesame oil in a large bowl. Set aside until the spaghetti is finished. Drain the spaghetti then add it straight into the sauce. Stir to combine. Now here's the best part! Toss the cucumber, peanuts + mint into that bowl + mix it all around. Have a taste + feel free to add salt + pepper to taste. This is great right away or chilled.